These breathtaking gardens and impressive historic spaces afford unrivalled settings for weddings, private and corporate events or TV hire. The Gardens are open all year except Saturdays. The Tea Room is open April-October. The Gardens are open 11.00-17.00 April-October and 11.00-16.00 November-March. Visit our Opening Times before you travel. 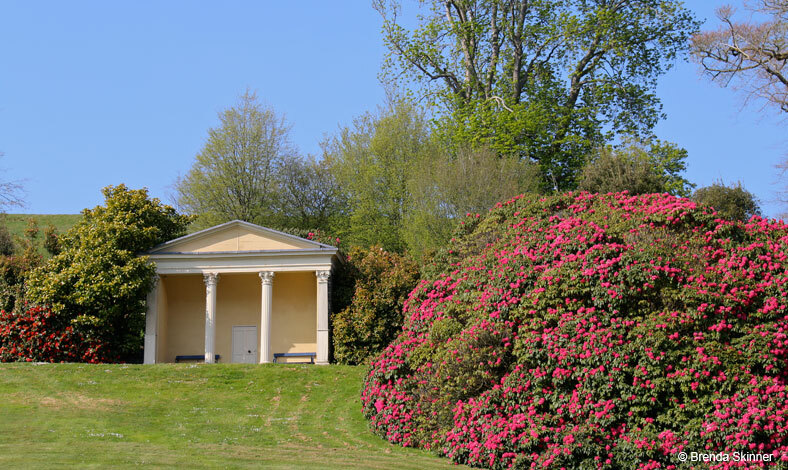 Latest on the Castle Hill gardens in the Spring! The Mansion House on the Castle Hill Estate provides a wonderful setting for a wedding, with large beautifully-adorned rooms and immaculately maintained gardens which are ideal for photographs. The Library, Red Room and West Wing are all available for wedding ceremonies. Receptions can take place in the Red Room (50 people), or the West Wing (100 people). With the addition of a marquee on the West Lawn adjoining the West Wing, up to 300 people can be accommodated for a reception. The Holwell Temple offers something that little bit different and provides the ideal fit for an intimate ceremony and or reception. Satyr's Temple is also available for a wedding ceremony and is in a romantic, woodland setting by Ugley Bridge and the river. Our magnificent historic home and garden is a venue for all seasons. The surroundings are magical, punctuated with an array of eye-catching mystical follies, temples and lakes. The house has a timeless elegance, whether you choose to organise a wedding, book a corporate event, bring a picnic and attend an outdoor theatre production, or merely come to stroll through the wonderful gardens. Your visit to Castle Hill will be a memorable one. We feel sure that Castle Hill, loved and cherished throughout 14 generations of the Fortescue family will envelop you in its extraordinary beauty. We are always delighted to hear your views and love to share your comments, please feel free to write in our visitors book in the tearoom and to pass on any comments or suggestions. Spectacular country setting. Beautifully managed Estate with stunning gardens. Walled garden, amazing fish pond, just must be seen. As a whole the gardens are stunning. The planting keeps the eye interested all the way round. Plenty of light and drama. We always enjoy our visits and Thank you for allowing us to enjoy your garden. Bowood is beautiful but yours is stunning. Beautiful & peaceful, walking fairly easy, even the uphill bits! Absolutely stunning. It was a glorious day and the gardens were at their best. The colours were still vibrant and at every turning we saw another amazing display of colour. We headed for the castle and reached it and really enjoyed our walk down. A grand walk with superb views. The shrubs are a creidt to you. Great coffee & cake too. We've had a lovely walk around the gardens. Plenty suitable for us even with a wheelchair. Had a lovely lunch here then tea and cake after our walk. Lovely ladies in kiosk. It is so beautiful here we will definitely return. A stunning display of camelias, rhodo's and azaleas and a sunny, blustery day to set them off. Lovely, surprising place, a pleasure to walk around even in a howling gale! Hot soup, bread & hot chocolate very welcome! I've enjoyed two consecutive days visiting the delightful estate; with my neighbour and friend and with my cousin and three pals. The weather on both days was sunny although breezy today. The herbaceous borders are stocked with a beautiful variety of perenials of all kinds. The walled garden is lovely to sit in and admire the vegetable plots between the pretty rose pergola. The extensive walks around the Estate give breathtaking views in all kinds of directions. We enjoyed coffee, lunch and afternoon teas on both days, delicious food served by freindly staff. We even met Lady Arran - a lovely surprise, so courteous and friendly. We hope to visit the church on the way home. I'm here again, lovely cuppa and slice of cake - superb! Beautiful gardens - a lovely and relaxing walk in lovely surroundings. Great lunch served by a super lady. Really enjoyed the lovely gardens after a very friendly welcome from your lady at the entrance kiosk & a delicious lunch. Well worth our visit & won't hesitate to recommend Castle Hill gardens. Lovely views, especially from The Castle. Beautiful blossom everywhere. Enjoyed the refreshments after the climb. My wife and I were on holiday last week and we spent a day in your gardens. we started off with a lovely welcome from your lady in the kiosk who made us a nice lunch; as a diabetic, I have to eat before any strenous activity. Although it was a fair climb to the Castle it was well worth the effort. We think the gardens where excellent, laid out very well with a surprise around every corner. Very good value as well. Keep up the good work and if we are ever in the area again, we will definitely visit again. Just to let you know we had a wonderful day out yesterday at Castle Hill gardens. The grounds are kept so well and the features of interest are wonderful. It was my Dad's birthday treat and we all really enjoyed the day. Thank you so much for opening up your gardens/grounds to the public, it brings joy and peaceful times in the countryside, in the castle, follies and riverside walk. I will tell other members of my family about Castle Hill, I'm so pleased to have found this lovely place to walk and see so many interesting things. On Bank Holiday Monday we went to spend an hour or two wandering in the Castle Hill gardens. We stayed four hours. The gardens are quite splendid. Several of the tucked away areas and well sited temples are quite enchanting. We received a warm and personal welcome from Michelle at the Kiosk who also provided us with an excellent afternoon tea. During our tour we happened to meet Lady Arran pruning her hydrangeas. She gave us a charming welcome and pointed out some key sights not to miss. Late into the evening we wandered the gardens with no one around and the sun slowly setting. Overall, a memorable visit, which we will certainly repeat. We highly recommed the garden for it's splendid vistas, carefully tended shrubs and endless interest. "Such beautiful gardens, stunning views in all directions. Love the natural feel and so peaceful. Another visit is a must. Friendly welcome at the kiosk and nice cup of tea and cake to finish off a memorable morning." "Best place of its type that we've been to; good value for money too." "Wonderful welcome followed by a fascinating tour of the house by Lady Arran - delicious lunch and later a walk around the beautiful grounds. Thank you Lady Arran and your staff." "From the moment we arrived we were made very welcome. The grounds were spectacular, wonderful weather and super service and tea. Many thanks to all. "Had a wonderful afternoon - grounds are beautiful and the views are breathtaking! Lovely cream tea too! What a well kept secret." "Fab afternoon. Gardens and walk way wonderful. Shrubs and trees very pretty. Cream teas lovely. People don't know what they are missing - I would recommend it!! "The tea and cakes were scrummy and the gardens are gorgeous." "A garden - nature gently manicured. A beautiful Spring array, particularly the wild flowers. A nice cup of tea at the end." "A very beautiful park. Very well looked after and a nice cream tea at the end of the walk. In all a lovely afternoon." "A wonderful walk round the park in delightful sunshine with great colour and interesting plants and bushes. Grateful thanks for the chance to experience such a lovely setting." 'Thank you so much for the help you gave us in organising our wedding. We had such a lovely day and the venue was beautiful'. "We really cannot thank you all enough. We received such amazing feedback and the daffodils really did add a wow to our guests' entry to Castle Hill. Thank you so much for all of your efforts in making our day so wonderful." "Dear Lady Arran - John and I would like to thank you for your generosity in allowing us such free rein in your stunningly beautiful home for our marriage. One of the main reasons why everyone had such a good time was because of the wonderfully warm and friendly atmosphere created by yourself and your excellent team. I can assure you that we will be revisiting your beautiful gardens annually! Clare, you and your team worked so hard and everything ran perfectly - so thank you so much. All the guests seem to have enjoyed themselves and were of course bowled over by the beauty of Castle Hill - what a fabulous place it is." "We had such a wonderful wedding reception at Castle Hill - you have such a beautiful home - thank you very much for letting us share it for the day! Everything ran like clockwork and Clare and Robert were fantastic." "Ian and I are so grateful to you for allowing us the use of your glorious house for our most special of days. Our guests are still talking about it even now and how beautiful Castle Hill is. Many thanks too must go to Clare for her impeccable service." "Thank you so much for all your help and co-operation in ensuring our wedding was such a fantastic day. We're very grateful." "Daniel and I wanted to say a big thankyou for helping us to organise the most wonderful wedding. It was a magical day and everyone had a fabulous time." " We would just like to say huge thank you to you and Robert and of course Lord and Lady Arran for making our day possible and such a success. We couldn't have wished for a more perfect venue and everyone we met at Castle Hill was so friendly and helpful in ensuring that everything went without a hitch. We both wish we could do it all over again but will make do with visiting the beautiful gardens which were the most sublime backdrop to our day." "Thank you so much for letting us have our wedding at your home. It was such a special and perfect day. Big thanks to Clare and Robert." "We would just like to say a big thank you for everything you did for us for our special day. You were so helpful and accommodation before the wedding day and we could not have asked for a more beautiful place to begin our married life."